I was invited to be on the launch team for Lynn’s new book- Legacy of Mercy. I was so ecstatic for being chosen! I love Lynn’s novels and I knew I was going to throughly enjoy this one! 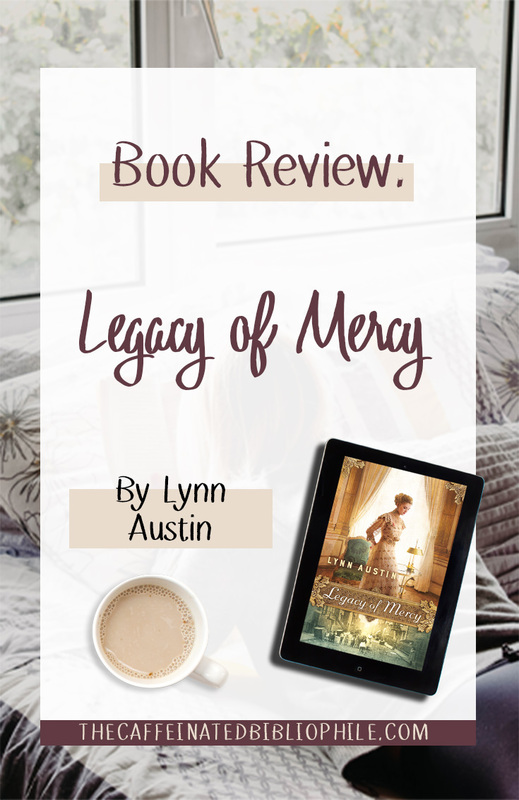 Legacy of Mercy is a continuation from the first book in the series, Waves of Mercy. Anna is a young woman who is engaged to a wealthy man named, William. In the previous book, Waves of Mercy Anna finds out she is adopted and her mother was a working class individual. Her mother died during a shipwreck saving her when she was just 3 years old. She never found out who her father was. She has hired a detective agency to find out who her father was and more about her mother. She was determined to find out more about her birth family. Ever since visiting her Grandmother in Michigan she desires to live more of a simple life. When she comes back her mother starts to help plan her wedding. Anna is soon overwhelmed by all the choices and the fact that William wants to live in a mansion. Anna has also recently renewed her faith in Christ and William does not have a strong connection with Christ, so there is that rift between them. William also desires to be a senator of IL but Anna doesn’t want to be in the spotlight. She wants to help the poor and be of assistance to them. Her family and others in her circle feel that she should donate to charities rather than be directly involved. I really felt for Anna because she really has this passion to help the needy but has an obligation to keep a reputation. I liked William. I appreciated that Lynn didn’t make him out to be this bad man. He was a gentleman and genuinely cared for Anna. But like Anna, I don’t think he loved her. He was just not the right fit for her. Clarice is one of the ladies in the society. She is kind of a little conniving B*&!!. She reminded me of Regina from Mean Girls. If there is to ever be a movie made for this book, Rachel McAdams would play the perfect part. I won’t go too much into what she did - as you have to read the book - but let’s just say she is not a nice person. The other part of the story we follow Gessje De Jonge back in Michigan. In the beginning she takes in a young lady named Cornelia and her grandfather. Cornelia is a 16 year old orphan that is utterly devastated. She is suffering from what we call today, major depressive disorder. We also find out that she is suicidal. Gessje is determined to help Cornelia heal and find hope again. I have never been to Chicago or Michigan and Lynn brought it to life so well. Lynn does impeccable research. She really has a knack for distinguishing the rich from the poor in the city. I also loved learning more about Holland, Michigan during this time and I didn’t know that the Dutch settled that particular area. And I had no idea that Holland, Michigan is Lynn’s hometown! While Legacy of Mercy is a continuation of the first book, Waves of Mercy I don’t think you need to read that one first to understand what is going on. Lynn catches you up in the first part of the book. I think authors should do this more because sometimes I forget major parts in the first book, especially if it’s been a while! The mystery of Anna’s father was done well. I had my suspicions who it was before it was finally announced (and I was right!) but I think Lynn didn’t make it too obvious. No spoilers here but I found the situation to be realistic. Let’s just say I really felt for Anna’s mom and it was not a happy situation. Anna grew a lot through this novel. I think she knew what she wanted right from the start. She didn’t want to be a part of the wealthy society. Though she was fully accustomed to the lifestyle, she appreciated the more simple life. I was happy to read that she stuck to her gut, and stood up for what she believed. Even though it caused scandals within the society. Later on in the story we are re-introduced to Derk. He is a young paster in Holland. In the previous book, Anna and Derk started to have feelings for each other. I really liked these two together. They fit so well together. He knew her desires, hopes, and dreams. And they loved talking about the Bible with each other; something she didn’t have with William. Cornelia, even though it was not a major part of the story I felt her story was the most depressing. She lost her entire family in a fire at the age of 13. I don’t blame her wondering why she was spared and then being angry at God for what happened. I think she really needed Gessje and Gessje needed her in a way too. I really appreciated that Lynn dove into real issues in this book like depression, poverty, and heartache. It made the novel relatable. Yes! It’s a beautiful book that reminds us that God loves us and has a plan for us. God knows our hearts desires. We just have to be patient and know that he has everything worked out for us in the end. 1. Legacy of Mercy will be released on October 2 and will be the first sequel you’ve ever written. What made you decide to write a sequel? 2. This story is set in your home town of Holland, MI. Did you discover anything surprising while you were researching these books? I knew very little about the early history of Holland, Michigan when I began this series—only that it was settled by Dutch immigrants. What surprised me was how much they suffered to establish a settlement here, including religious persecution, a malaria plague, and a devastating fire. Their enduring faith in spite of all their many trials was a huge inspiration to me. 3. The city of Holland must have seen an increase in tourism since you started writing about it. You even did a bus tour, tell us about it. The book seems to have sparked a renewed interest in local history. The Holland tourist bureau told me they’ve guided several happy tourists to the places described in my book. And I was very pleasantly surprised by the interest in my “Waves of Mercy” bus tour! When I offered to guide interested readers to some of the settings from my book, I never imagined there would be enough interest to fill two chartered busses! There may even be another tour after “Legacy of Mercy” releases. 3. You are known for writing multi-generational books and Legacy of Mercy is no exception. What intrigues you about writing in this style? 4. Which character in Legacy of Mercy do you identify with the most and why? 5. When you sit down to write a story, do you know how it is going to end? Describe your writing process. How do you stay disciplined and not get distracted? 6. Did anything surprise you about the Legacy of Mercy story? Also, the ending surprised me—a lot! I hope that all of my readers who asked for a sequel are pleased with it. For many years, Lynn Austin nurtured a desire to write but frequent travels and the demands of her growing family postponed her career. When her husband's work took Lynn to Bogota, Colombia, for two years, she used the B.A. she'd earned at Hope College and Southern Connecticut State University to work as a teacher. After returning to the U.S., the Austins moved to Anderson, Indiana, Thunder Bay, Ontario, and later to Winnipeg, Manitoba. Extended family is also very important to Austin, and it was a lively discussion between Lynn, her mother, grandmother, and daughter concerning the change in women's roles through the generations that sparked the inspiration for her novel Eve's Daughters. Along with reading, two of Lynn's lifelong passions are history and archaeology. While researching her Biblical fiction series, Chronicles of the Kings, these two interests led her to pursue studies in Biblical Backgrounds and Archaeology through Southwestern Theological Seminary. She and her son traveled to Israel during the summer of 1989 to take part in an archaeological dig at the ancient city of Timnah. This experience contributed to the inspiration for her novel Wings of Refuge. Lynn resigned from teaching to write full-time in 1992. Since then she has published 27 novels. Eight of her historical novels have won Christy Awards for excellence in Christian Fiction: Hidden Places (2001), Candle in the Darkness (2002), Fire by Night (2003), A Proper Pursuit (2007), Until We Reach Home (2008), Though Waters Roar (2009) While We're Far Apart (2010), and Wonderland Creek (2011). She was inducted into the Christy Award Hall of Fame in 2013. Fire by Night was also one of only five inspirational fiction books chosen by Library Journal for their top picks of 2003, and All She Ever Wanted was chosen as one of the five inspirational top picks of 2005. Lynn's novel Hidden Places has been made into a movie for the Hallmark Channel, starring actress Shirley Jones. Ms Jones received a 2006 Emmy Award nomination for her portrayal of Aunt Batty in the film. I hope you enjoyed the review & author interview! Have you ever visited Chicago or Lake Ottawa? Share your experiences! NOTE: I am on the launch team for this book and I was sent a copy of this book to review by the publisher. All opinions are my own.